Garstang again showed their penalty prowess with victory against Maine Road in round three of the First Division Cup. Having lost at AFC Blackpool in midweek, the Riversiders drew 1-1 before eventually winning the shootout, 13-12. It was Garstang’s fifth consecutive penalty shootout win of the season and, during that run, they have scored 31 penalties from a possible 32. In front of a sparse home crowd the first half was a drab affair with the hosts having the better of the play and Garstang looking dangerous in flashes. Jack Bennett and Reece Barrett linked up well but saw Dan Birch’s low cross just cleared from in front of goal. At the other end, Garstang keeper Will Kitchen made a superb close-range save to keep the scores level, while Ric Coar had a glorious chance when put through on goal but the home keeper saved with his outstretched leg and then the rebound was fired wide by Jake Salisbury. He also saw an excellent effort fly just wide of the post but, generally,both sides were let down by the final ball and cancelled each other out in a goalless first half. The second half saw Garstang play much brighter and higher up the pitch, reducing the hosts’ time on the ball. However, against the run of play, Maine Road took the lead on the hour when Lee Hendley’s shot took a wicked deflection off Phil Nagy and found the corner of the net. Swindlehurst also cleared off the line but Garstang did not panic and started to get back into the game. 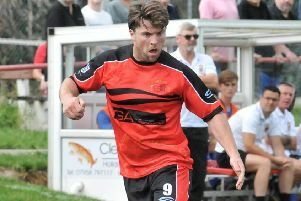 Their improved performance was rewarded with an equaliser on 70 minutes when Birch sent over a cross from the right. With Salisbury making a nuisance of himself, the ball fell kindly to Bennett who scored his first goal for the club with a close-range equaliser. Both sides had further half-chances to settle the game in normal time but, at full-time, the score was 1-1 and the tie went to penalties. In a high-quality shootout both sides scored 12 consecutive penalties each with both keepers also converting. Garstang scored their 13th penalty before Kitchen saved the home side’s last penalty to give them victory and set up a quarter-final tie at Avro. With no midweek game, they can take a rest and prepare for their next outing at Chadderton on Saturday.